STOP PRESS: Spoon-billed Sandpiper in Beijing! Juvenile SPOON-BILLED SANDPIPER, Ma Chang, Yeyahu, Beijing, 31 August 2014. Photo by Zhang Minhao. by Zhang Minhao, October 16, 2014. “The Spoon-billed Sandpiper was photographed at Machang, Yeyahu, Yanqing County, Beijing, on August 31, 2014. At around 09:45am on 31 August 2014 I was observing Red-necked Stints, Long-toed Stints, and Long-billed Plovers near a large area of water on the edge of Guanting Reservoir. This area is known as Ma Chang, Wild Duck Lake. In order to avoid missing the distant shorebirds, I checked the areas where the Red-necked Stints were located by looking through my camera, and took pictures of the birds I could see. When reviewing my photographs I recognised something distinctive, a juvenile Spoon-billed Sandpiper. The time of the photograph was 09:49am. (Thanks to Guan Xiangyu for contacting Zhang Minhao about this account and to Huang Hanchen for the translation). There are several brilliant things about this record. First, it’s a SPOON-BILLED SANDPIPER, one of the world’s most endangered birds (see here to read about just how few remain and for details of the international effort to try to save this species). Second, it’s of a juvenile, one of very few sightings of a Spoon-billed Sandpiper of this age in the world, giving hope to the conservation effort. Third, it was found in Beijing, one of the world’s major capital cities, more than 150km from the coast. And finally, the finder was a young Chinese birder. It’s a truly remarkable record. 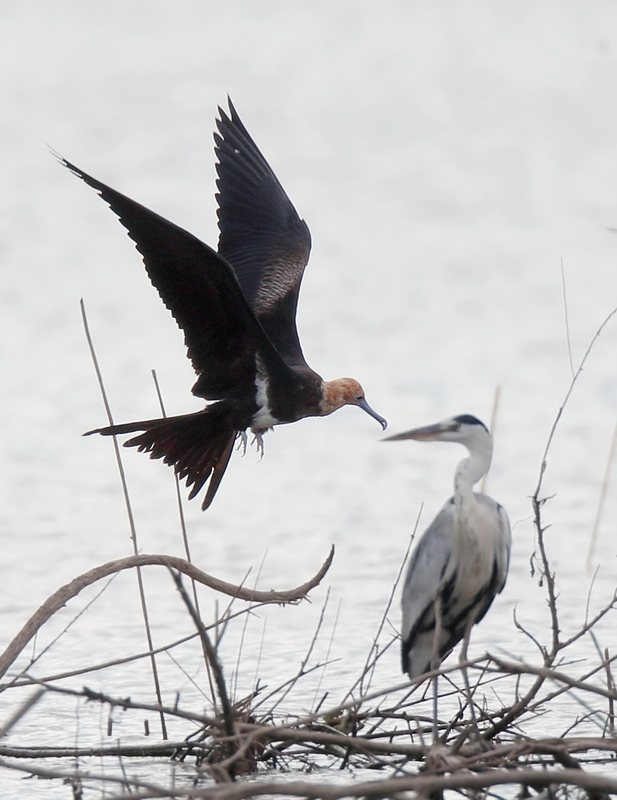 And I hope this sighting by Zhang Minhao inspires other young people in Beijing and beyond to take up birding and to become part of an ever-louder voice to help conserve the amazing biodiversity with which China is blessed. Posted on October 15, 2014 October 17, 2014 Categories UncategorizedTags Guan Xiangyu, Huang Hanchen, Ma Chang, Spoon-billed Sandpiper, yeyahu, Zhang Minhao9 Comments on STOP PRESS: Spoon-billed Sandpiper in Beijing! 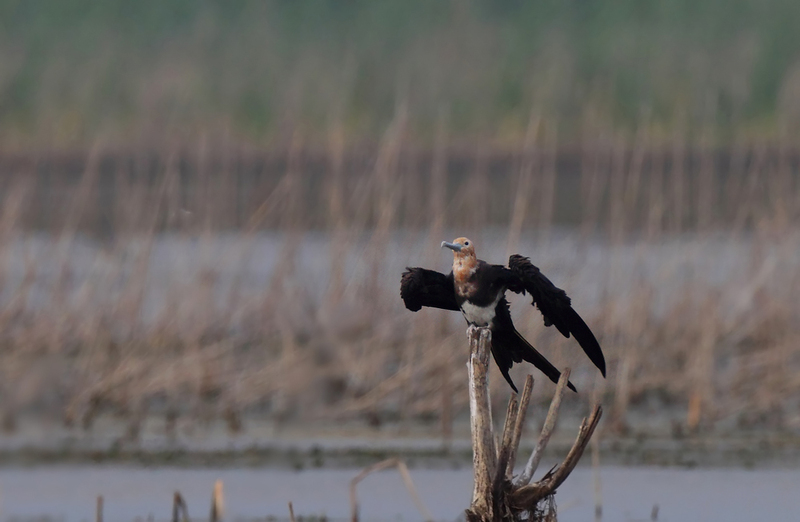 After participating in Sunbird’s tour of Qinghai and Tibet, led by Paul Holt, German birder Henning Lege decided to stay on for a spot of birding in Beijing. 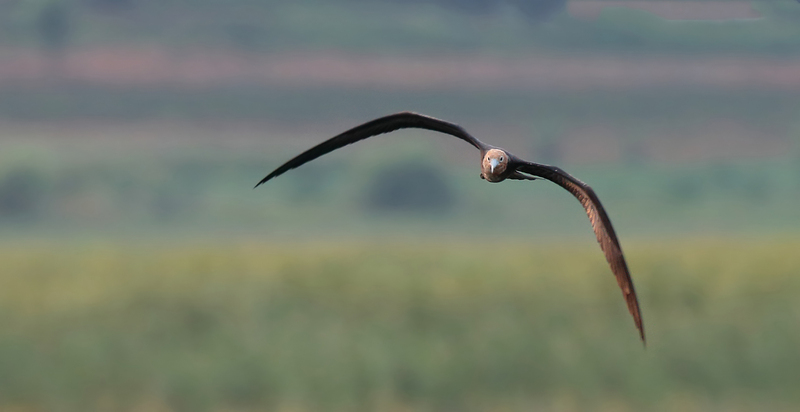 On 20 August he visited Miyun Reservoir, one of Beijing’s premier birding sites, where he found a juvenile LESSER FRIGATEBIRD (白斑军舰鸟, Fregata ariel) – the third record of this species in Beijing. Fortunately there were some Chinese birders from the Beijing Birdwatching Society, including its President, Ms Fu Jianping, on site with whom Henning could share his excitement. And, on his return to Beijing, he was quick to alert Paul who immediately circulated a message via the rapidly growing Birding Beijing WeChat group, meaning that local birders were alerted and had an opportunity to see it. 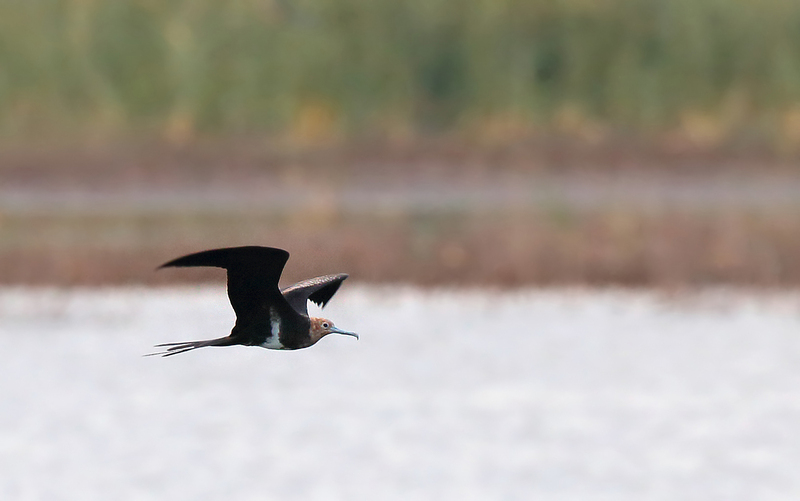 Since its discovery on 20 August several groups of birders and photographers (possibly more than 20 in total) have visited and enjoyed this spectacular, almost prehistoric-looking bird, meaning it must be one of Beijing’s most “twitched” rarities ever. 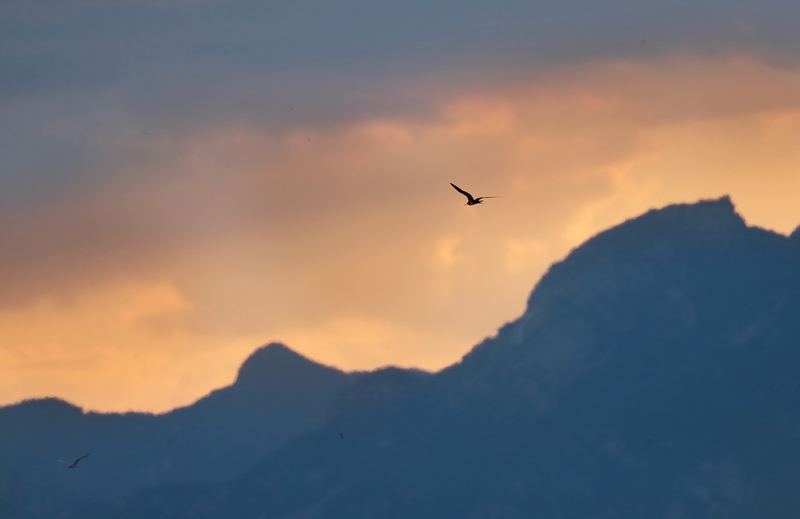 With the nearest coast around 150km away, seabirds are, not surprisingly, hard to see in Beijing. There is only one record of a skua (a Long-tailed) and even species such as Saunders’s Gull and Great Knot (not uncommon on the coast), have never reliably been recorded in the capital. 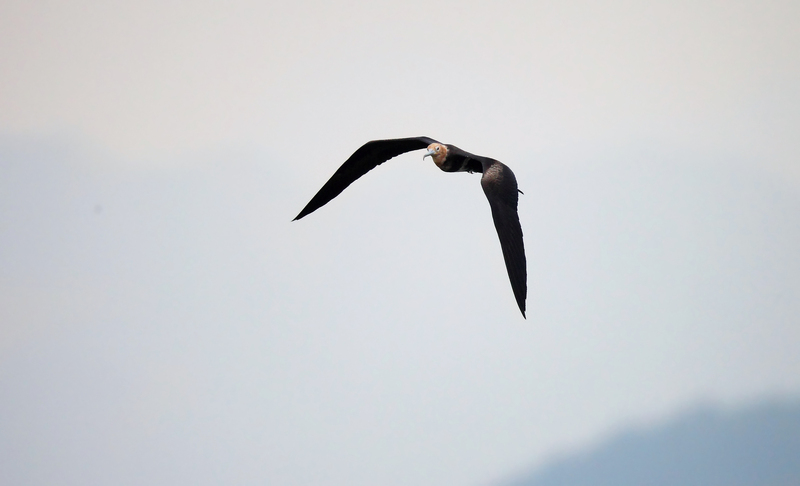 So it is perhaps surprising that three LESSER FRIGATEBIRDS – truly pelagic birds – have made it to Beijing. The previous two Beijing sightings were both in April – in 2007 and 2011. 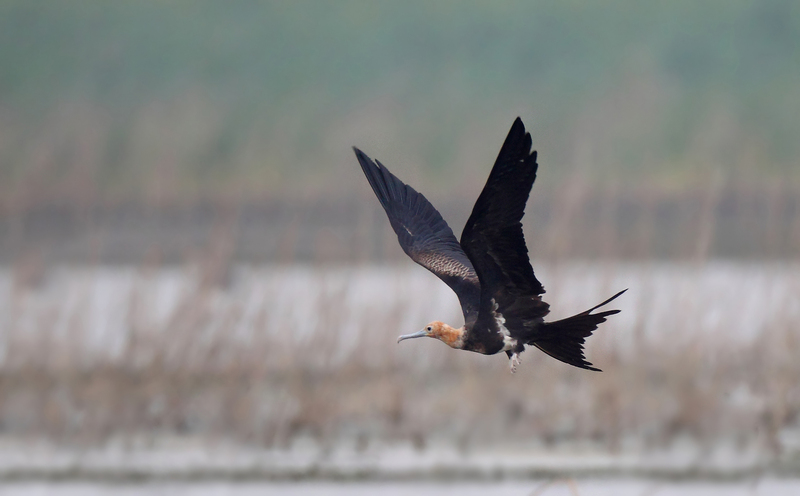 The first was photographed by Hong Wanping at Shahe Reservoir, Changping 14 April 2007 (see China J. of Zoology (2011.4) Lesser Frigatebird, Shahe reservoir, April 2007 for a brief account). 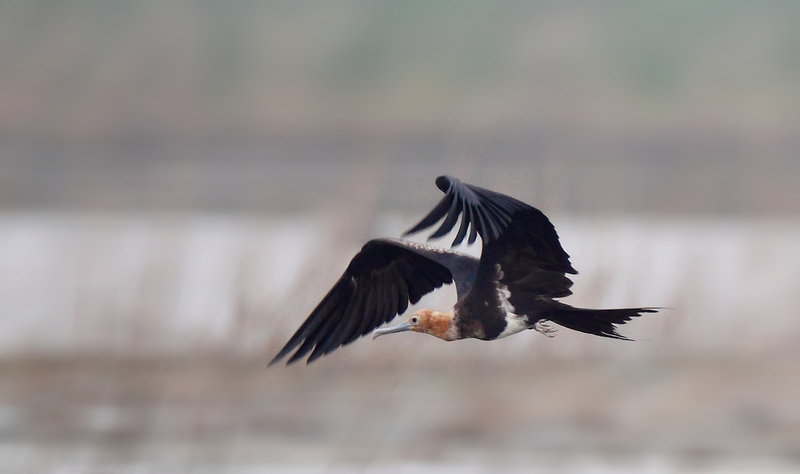 The second was seen, and photographed, at the Ming Tombs Reservoir (Shisanling Reservoir) on 7 April 2011. 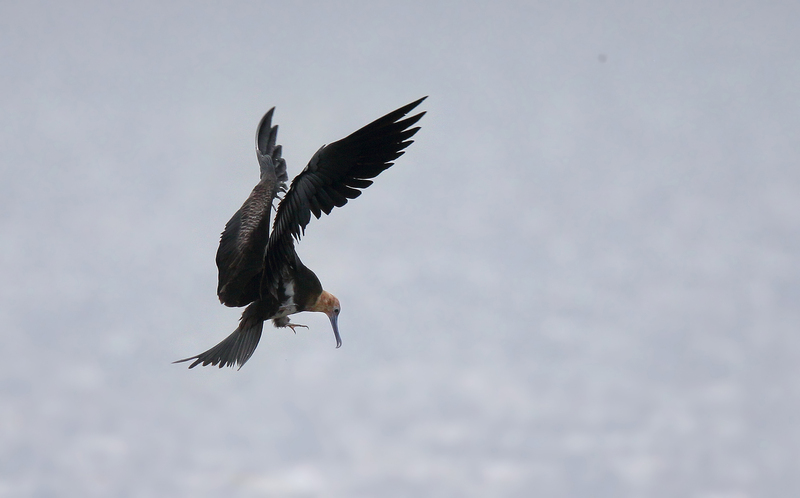 LESSER FRIGATEBIRD is rare anywhere in China, though it may be just about annual in Hong Kong where regular pelagic trips are now taking place. There are reports from most coastal provinces from Guangxi to Guangdong, and Fujian north to Zhejiang, Jiangsu, Shandong, Tianjin & Liaoning. 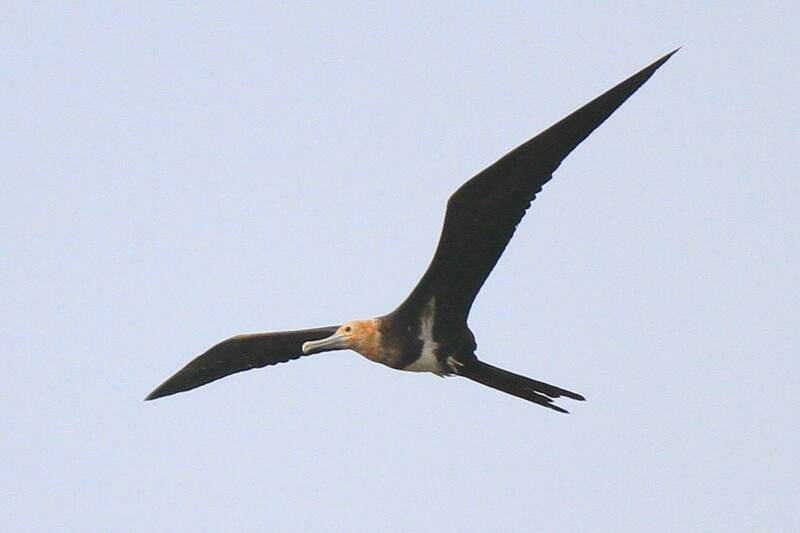 Although we are not aware of any records from coastal Hebei, there are two reports of GREATER FRIGATEBIRD from Beidaihe, Qinhuangdao, Hebei with an immature on 6 June 1996 (Thalund et al. 1994) being the second of these. One can only assume that this most recent bird was displaced by one of the recent tropical storms, possibly Typhoon Halong that hit east Asia in early August. Thankfully, documentation of this record has not been difficult. 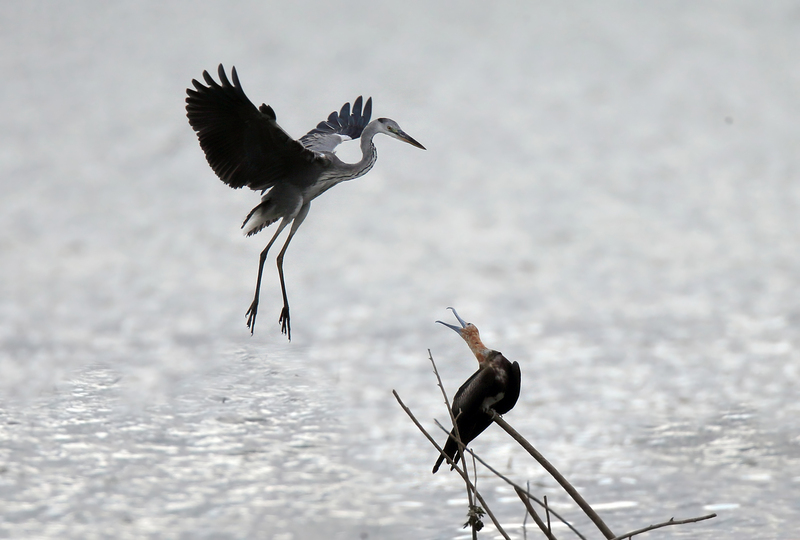 In addition to Henning’s notes, China is blessed with some superb bird photographers. The brilliant set of photos below is by Zhang Weimin with an additional stunning photo by Huang Hanchen, to both of whom big thanks are in order for allowing me to reproduce their wonderful photos for this post. 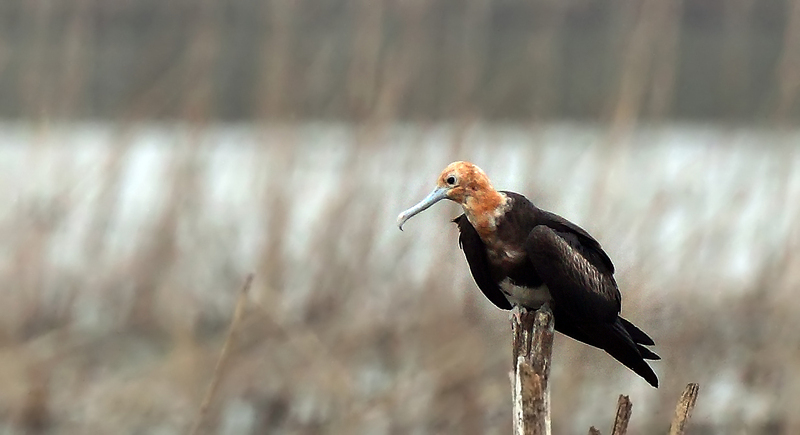 According to The Handbook Of The Birds Of The World (HBW), the LESSER FRIGATEBIRD breeds on small, remote tropical and sub-tropical islands, in mangroves or bushes, and even on bare ground on islands in the Indian and Pacific Oceans. It feeds mainly on fish (especially flying-fish) and squid, but also on seabird eggs and chicks, carrion and fish scraps (del Hoyo et al. 1992). It is “kleptoparasitic” – a great word that means it habitually steals food from other species. Unfortunately for Paul and me, this bird was found whilst we were overseas, Paul in Canada and me in the UK. After arriving back in Beijing on Saturday morning I visited the site with Paul and local birders Wu Lan and Zhao Min on Sunday and despite staying all day, we failed to see it. The last documented sighting was on Friday 29 August. Unless it has been hiding effectively for the last couple of days, it has almost certainly moved on, hopefully on its way back to the Pacific Ocean where it belongs. 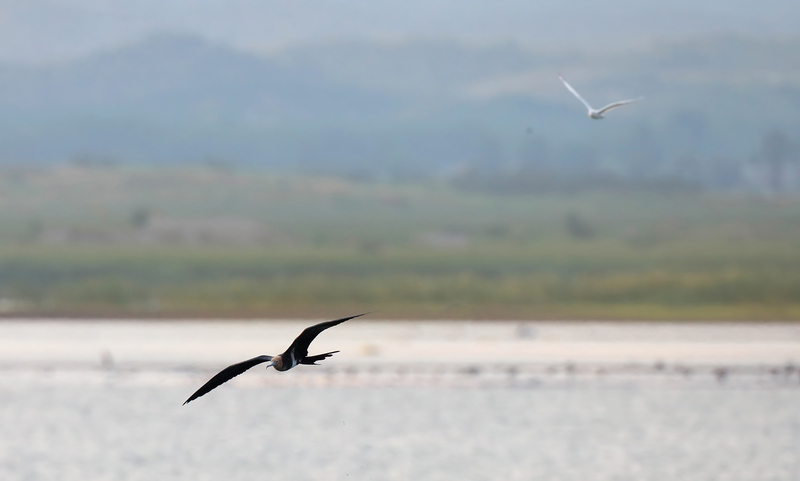 Big thanks again to Zhang Weimin and Huang Hanchen for the use of their photographs, to Paul Holt for the information about the status of Lesser Frigatebird in Beijing (and China) and to everyone on the WeChat group who provided updates about the bird’s whereabouts during its stay at Miyun Reservoir.